Hate crimes are considered a serious problem. There are increased penalties for crimes motivated even “in part” by prejudice, and the FBI issues an annual report on hate crimes. 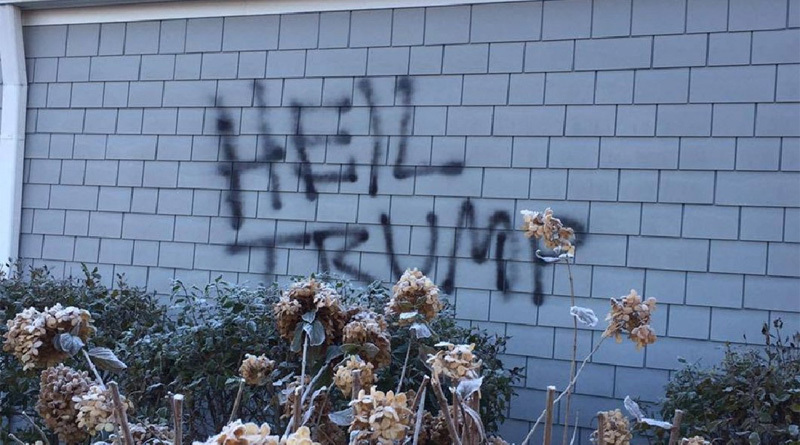 Hate crimes—which are also known as “bias crimes”—are reportedly on the rise since the candidacy and presidency of Donald Trump. However, a number of high-profile alleged hate crimes have proven to be hoaxes that were staged by the victim. How many hate crimes are hoaxes? How often does a black person send himself racist hate mail or a Muslim woman falsely claim that whites tore off her hijab? No government agency counts these incidents, but now we can answer these questions. Click on markers in the map below to see summary details of each hoax. For more detailed information, including a sortable spreadsheet view, click here. 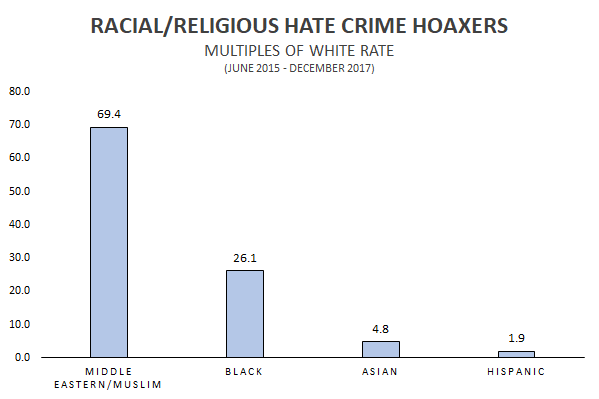 We have done an analysis of recent hate-crime hoaxes with a particular concentration on the period beginning June 2015—the month Donald Trump announced his candidacy—and ending December 2017. We believe there were enough hoaxes in that two-and­-a-half year period to provide what we believe are representative data. We have attempted to include every case of every instance of every kind of bias hoax. The only exceptions are fake bias crimes against people with mental or physical handicaps. These cases are extremely rare, and it is possible that there was not a single reported hoax of this kind during the period beginning in June 2015. Otherwise, we believe our data, based on an extensive media searches and on existing compilations, are exhaustive. We will also update our database as future hoaxes are reported. If readers know of cases since June 2015 that we have missed, please contact us here. It is clear from the map that hoaxes occur in virtually every state, and are most common in population centers. It is also clear from the fine-grained sorting of data that is possible using filters, that of the 101 people who perpetrated hoaxes from June 2015 to December 2017, by far the largest number (44) fabricated acts of bias against blacks. 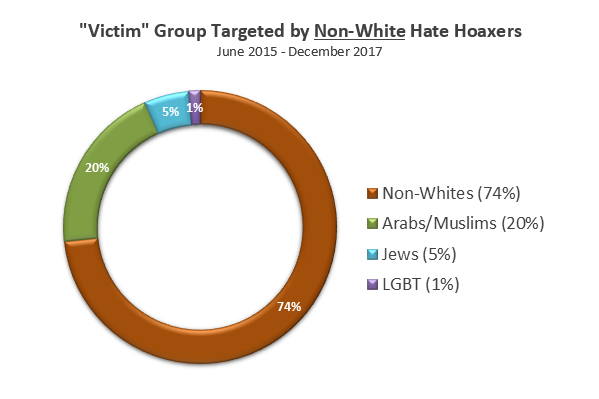 The next most common “victim” categories of fake bias crimes were Middle Easterners/Muslims (17), non-whites in general (13), and LGBT people (10). Sixty-four percent of the hoaxers are male. In the FBI’s latest hate crimes report, blacks are overrepresented as offenders. They account for 26.1 percent of those cases in which the race of the perpetrator was known, meaning that they were 2.4 times more likely than non-blacks to commit hate crimes. It is not possible to make a direct comparison to whites because—and this is a long-standing defect in a report that is supposed to highlight race and ethnicity—the report does not clearly distinguish between whites and Hispanics. In the case of hate-crime hoaxes, black overrepresentation is much greater. As indicated in the graph below, over the last two-and­-a-half years, on a per capita basis, blacks were 13.3 times more likely than whites to commit hate-crime hoaxes, and Middle Easterners were 34.7 times more likely. In our data, Hispanics and whites are clearly distinguished, and Hispanics were as likely as whites to perpetrate hate hoaxes. The few cases in which the race of the hoaxer is not known are not included in the graphs that follow. 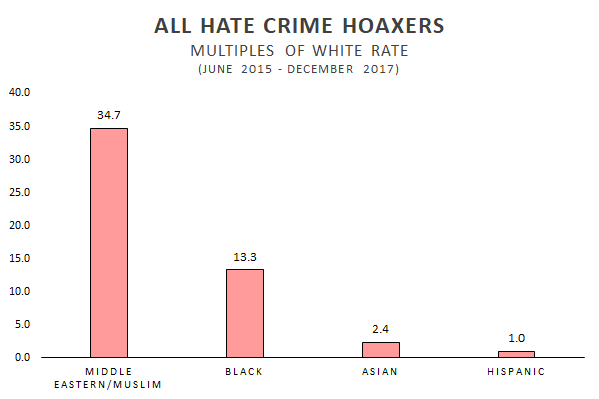 For the most part, it is correct to assume that bias-crime hoaxes are committed by a member of the group that was falsely targeted: gays commit anti-gay hate hoaxes, and blacks commit anti-black hate hoaxes. Of cases with whites perpetrators, only 3 of the 18 committed hoaxes in which whites, as a race, were the targets of fake hate; the rest meant to draw sympathy to LGBT people, other non-white groups, or women. 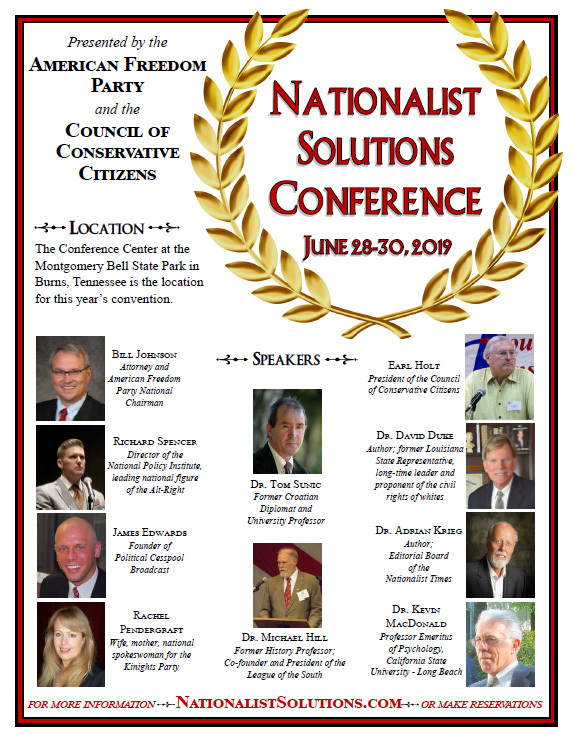 A few “progressives,” for example, have drawn swastikas or written racial slurs in the hope of evoking sympathy for non-whites or to justify increased anti-racist activity. Whites were therefore more likely to perpetrate hoaxes designed to evoke sympathy for non-whites or Muslims than for whites. We found no case of a non-white committing a false hate crime meant to promote sympathy for whites as a group. Eighty-nine percent of hoaxers tried to convey the false appearance of racial or—in the case of Muslims and Jews—a religious/ethnic bias. 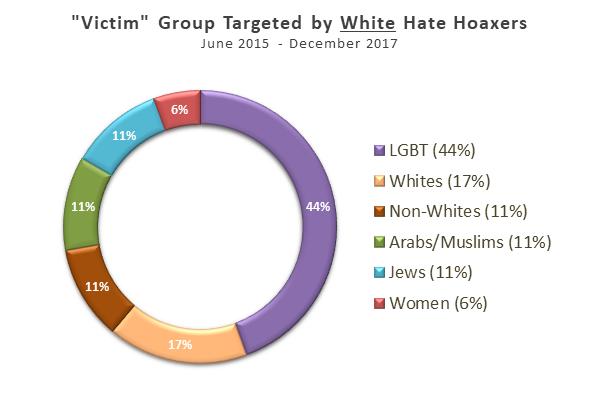 If we restrict our analysis to these hoaxes—that is to say, if we exclude cases in which the fake targets of the hate crimes were LGBT people or women—whites are the group least likely group to be hoaxers, and the multiples for other groups rise accordingly. Middle Easterners, at 69 times the white rate, were the group most likely to fabricate hoaxes of this kind, and Hispanics were almost twice as likely as whites to be hoaxers. Many incidents officially reported to the FBI as hate crimes are never solved because the perpetrator is never identified. A certain number of unsolved hate crimes are likely to be hoaxes like the incidents described in detail in our interactive map. In the absence of confirmation there is always the possibility that a bias crime is a fabrication intended to evoke sympathy for the group of which the “victim” is a member. We will update our data as new hoaxes come to light. Again, we urge readers to keep us informed about hoaxes—or even suspected hoaxes—of which they are aware by sending us press or police reports. ← How Dare The New York Times Highlight Campus Insanity!